Cost to install and set up a home theater varies greatly by region (and even by zip code). Get free estimates from home audio/visual installers in your city. Cost to install and set up a home theater varies greatly by region (and even by zip code). Get free estimates from home audio/visual installers in your city. How much does it cost to install and set up a home theater? Many people want to view their favorite films and shows in the comfort of their own homes, and they can maximize their enjoyment by setting up TVs, sound systems, and other equipment to create home theaters. Home theaters are entertainment centers built in private homes to replicate the quality of viewing media in a cinema. Is the creation of a home theater a DIY project? If so, what sort of time and expense are involved? According to electronics expert Robert Silva, the average home theater setup will require only 1.5 hours of time. It’s easily done on a DIY basis by someone familiar with the equipment and with the selection of appropriate locations for speakers. If you don’t have these skills, it’s recommended that a qualified professional be hired for the installation. For this guide, we examine the cost of hiring professionals to install a home theater. For this discussion, we will consider the cost of installing a home theater with a mounted 1 48" LED TV a smart HTIB, cable service and audio setup, which averages $1,300. However, a premium home theater with TV calibration, custom furniture, audio setup, and speakers stands, among other things, can cost up to $16,500. For this discussion we will consider the costs of hiring an electronics specialist to set-up a home theater in a room dedicated to this purpose. Generally, home electronics stores will offer qualified services for reasonable rates, and this is especially true if the homeowner purchases components for their home theater from the shop. Consultations for home theater installations run at $100. The cost of a basic installation starts at $150 and can grow to $800 or more when you add in TV mounting 1, audio set-up, and more. 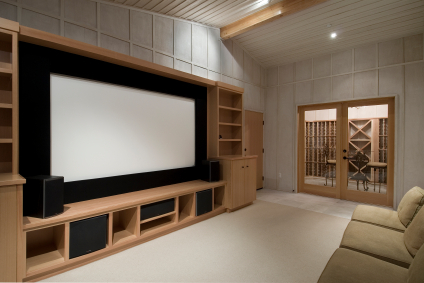 If you have a complex and expansive home theater project, the labor costs will be higher and can be determined during a consultation. Wireless speakers - These are useful for larger rooms that can benefit from optimal placement of a 7:1 speaker array. Speaker stands & mounts 1 - These cost less than $100 per pair and can allow the installer or the homeowner to position speakers in perfect locations. TV mounts 1 - TV mounts 1 allow you to hang your tv on your wall, and cost $10 - $700. Flexible models that allow you to change the TV’s position are at the higher end of the cost spectrum. Upgrading electrical supplies - Not all homes will have the appropriate number of suitable outlets for the average home theater set-up. This might mean that an electrician (charging an average of $65 - $85 per hour) will be needed to install additional 120 volt receptacles (approximately $100 each) to facilitate usage of the equipment. Streaming media devices - Devices like Roku, TiVO, and Apple TV will give your home theater a full library of movies, TV shows, games, and apps. They cost $40 - $600. Home theater furniture - With the amount of equipment needed to set up a home theater, it’s handy to have a place to neatly put it all. TV stands/cabinets cost $70 - $3000. TV calibration - This is a professional service that will adjust your TV’s image to be optimally sharp and colorful. This costs $150 - $250. Remote control programming - If your chosen home theater equipment includes a smart remote, professionals can program it to be linked to all of your home theater devices. This costs $50 - $100. You can reduce costs with HTIBs. These sets will usually contain all of the major electronics necessary for a high-quality home theater experience. Average costs for HTIB options range from prices as low as $100 to well above $1500. The minimal equipment must include the speakers, subwoofer 2, amplifier, and a DVD player. This varies according to the number of individual speakers provided and uses either a 5:1, 6:1, or 7:1 arrangement. These number ratios describe the different standard orientations that have been found to work well for most home theaters. The one that’s best for your home theater depends on the shape of the room it’s in, and can usually be determined by a professional. The home theater expert will need to assess the size of the room during a consultation to determine project pricing and scope. This is necessary if your speakers will use wires that will need to be concealed. Accounting for this will increase costs, due to extensive wire lengths and the need for precise installation. Confirm whether your installer will use the onboard Test Tone Generator that is part of most sound systems, or if they will bring a sound meter to the site in order to get optimal results. How much does it cost to install and set up a home theater in my city? Cost to install and set up a home theater varies greatly by region (and even by zip code). To get free estimates from local contractors, please indicate yours. Component of a loudspeaker system designed to produce low end bass frequency sounds. 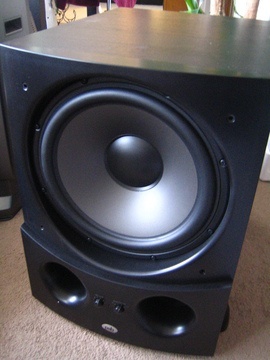 Cost Considerations: On average, subwoofers run between $150 and $500. Prices vary according to brand, type, and size.